Finally, the right tool for the job. The T-Rex Ripper Staple & Nail Extractor pry bar was created from the need to quickly pull flooring staples during demolition. 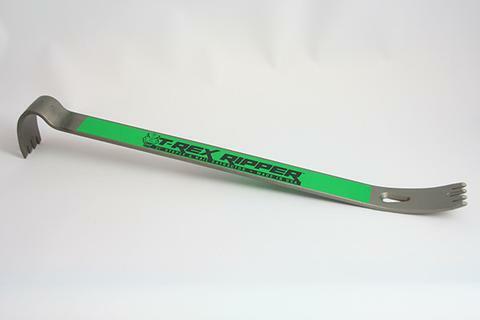 The T-Rex Ripper extracts nails and staples, making all other pry bars and nail pullers obsolete. The new, patented, rounded, four-tooth design allows fast, efficient extraction of staples and nails, large and small. In addition to being a strong prying tool, the bar can also be flipped over and used as a scraper to remove carpet pad staples. Carpenters, carpet layers, flooring installers, roofers, framers, electricians, plumbers, home remodelers, demolition companies, and do-it-yourself remodelers and homeowners. 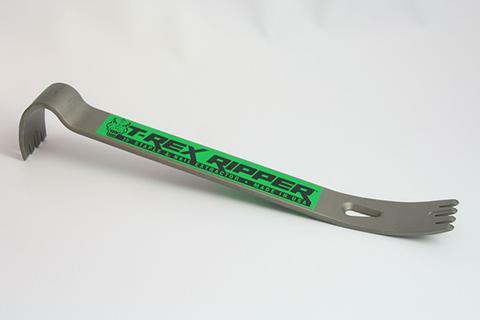 The T-Rex Ripper comes in 3 sizes: 11-, 15- and 21-inch. The 11-inch bar is useful for pulling fasteners in tight spaces, like between joists. The 15-inch bar is an all-around handy size that provides good leverage in a compact size. The 21-inch bar has extra leverage to make easy work of large demolition projects. 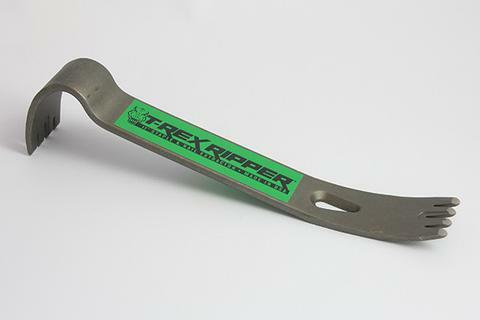 The T-Rex Ripper Staple & Nail Extractor pays for itself in time saved. We own one of the first versions of the 11″ T-Rex, and we’ve used it countless times! We are DIYers that do home projects on the weekends and we love our T-Rex so much that we’ve lent it out to friends and family for their projects (but we ALWAYS make sure to get it back)! It’s amazing how this properly designed tool can save time, energy, and hand cramps when removing flooring staples/nails. We’ve also used it in other ways (as a small prybar, to set engineered wood floorboards against the wall, etc.). I don’t know how anyone in the construction business has worked so long without this. Where has this tool been all my life? It just saved me hours worth of work. Glad to support you guys.